The material discussed here is part of the records of the Hungarian-Mongolian Expedition for the Research on Dialects and Folk Culture. One of the main aims of the expedition was to investigate the relics of the traditional Mongolian folk culture and to document its present-day transformation. The folk religious practices are vivid among many ethnic groups in Mongolia and their pantheon is a remarkable cultural phenomenon. Dayan Deerh is one of the best known deities, even beyond the boundaries of the region where it is worshipped (Cagaan Üür in Hövsgöl province). The present paper is based on fieldwork material and investigates the living tradition of Dayan Deerh’s worship, comparing an illustrated source (a Buddhist thangka painting) and the oral tradition (shamanic invocations). Les matériaux discutés ici font partie des résultats de l’Expédition Hongroise-Mongole pour la Recherche sur les Dialectes et la Culture Populaire. L’un des principaux objectifs de cette expédition est d’explorer les vestiges de la culture populaire mongole traditionnelle et de documenter son évolution à l’heure actuelle. Les pratiques religieuses populaires sont très vivaces parmi les groupes ethniques de Mongolie, et leur panthéon est un fait culturel notable. Dayan Deerh est l’une des divinités les mieux connues, même au-delà des frontières de la région où elle est vénérée (Cagaan Üür, Province du Hövsgöl). Cet article est basé sur des matériaux de terrain, et explore la tradition vivante du culte de Dayan Deerh, en comparant une source illustrée (un thangka bouddhique) et la tradition orale (invocations chamaniques). 1As a member of the Hungarian-Mongolian Expedition for the Research of Dialects and Folk Culture,1 I have had the chance on several occasions to collect material about the cult of Dayan Deerh2 (Mong. 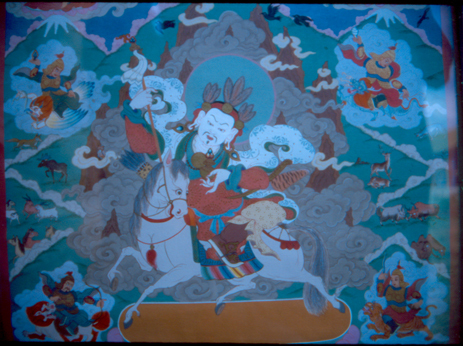 Dayan Degereki), perhaps the best-known Mongol shaman deity. Mythological, folkloric and textual material concerning Dayan Deerh have been touched on by several papers, focusing primarily on the deity’s myth of origin (Birtalan 2001, pp. 967-969) and on the related ritual texts.3 Interlaced with Dayan Deerh’s cult is a fertility rite attached to a cave, in Cagaan Üür district (Hövsgöl province). Also linked to this cult are an initiation rite for yellow shamans (shamans with Buddhicized rites) and part of an initiation ritual for black shamans, as well as the worship of the protector the Buddhist doctrine. This complex and manifold cult renders the associated traditions particularly interesting and is detectable in sacred texts of different genres, in myths of origin and legends living on in the oral tradition. 5 See Birtalan 2005a for details. 6 For the analysis of a Tibetan sacrificial text see Török 2009. 7 I analyzed such a text in another study (Birtalan 2005a). 8 Birtalan 2001, pp. 967-969; for a detailed bibliography see p. 969. 5In parallel to the oral tradition, the original pre-Buddhist representation of Dayan Deerh, a man-shaped stone figure, played a salient role for believers. Unfortunately, it fell victim to the ideology of the socialist period when attempts were made to eradicate all manifestations of the traditional beliefs (i. e. Pre-Buddhist, animist religious ideas), Buddhism and the syncretic folk religion, causing damage to Mongolian culture. The whereabouts of the statue is unknown, it is said to have disappeared in the 1950s (Galdanova, Zhukovskaya, Ochirova 1984). In the early 1990s, when there was room again for religious beliefs and practice, there was such an ardent need for representation that a new stone statue was erected without knowing the original. It is not known where the old statue used to be located (that was on the territory of the former Deerhiin hüree, the Buddhist monastery of the district), but rather in a former hotel converted into a shrine in the centre of Cagaan Üür discrict in Hövsgöl province (fig. 3 and fig. 4). A face was drawn on a boulder and a symbolic war helmet of metal was put on its top. 7The story of the original stone statue appears in sacral texts. The following excerpt gives an account of how the warriors of Chinggistried to destroy the statue that Dayan Deerh had allegedly turned himself into. “Id šid üjüülew” – geed. Yoriin muu üjegdel” – geed bucaw. Swords and sabres got blunted. “He shows magic power” – they said. 8In Inner Asia, the pre-Buddhist belief systems were based on animist ideas. One of the most typical manifestations of Mongolian animism and the basis of the religious practice of shamanism is the protective spirit or ongon.12 The ongon is a highly complex phenomenon, most importantly for the topic of our paper, the depiction of ongon by shamans, using most diverse materials and techniques, constitutes the central piece of their ritual practice (Birtalan 1996b, pp. 28-46). The ongon is then preserved in the place of honour of the abode (be it a yurt or a house). Sometimes an ongon is placed in nature, and even a natural phenomenon can be designated as the emanation of a protective spirit. Although Dayan Deerh is also venerated as a protective spirit and a shaman-initiating spirit, I had not come across his pre-Buddhist ongon-like representation during my research until now. 9But several representations of Dayan Deerh with a Buddhist background are known. They include multi-figural scroll paintings, textile prints of one or three figures (fig. 5), and the statue of Dayan Deerh as a Buddhist dharma-protector war god erected in the cave of the fertility magic. This statue, which we have been fortunate enough to document during our expedition, hadalready been describedand reproduced as a hand drawing in the early 1980s by Galdanova, Žukovskaya and Očirova (1984, pp. 2-3), the co-authors of a study on the cult of Dayan Deerh. 10We found the statue in a rather deteriorated state, but it is enjoying extraordinary reverence, as indicated by the blue hadags (Mong. qadaγ, Tib. kha btags, a sacrificial silk scarf) that covered it almost entirely (fig. 6). It is not easy to describe the statue, as the attributes are missing from its hands and its left one is even broken. It is wearing a war helmet; this detail is also clear on the drawing in the above mentioned study by the three authors. Originally, the statue might also have been the depiction of Beg-tse or a dalha (see below for details). 13 The study uses the written Mongolian variant (Dayan Degereki), see Vinkovics 2003a, p. 84. 11Several museums and private collectors have drawings or paintings in which the main or only figure is said to be Dayan Deerh. What all of them have in common is that the figure is an equestrian deity whose apparel may include some typical Mongolian garments (primarily the boots). I have briefly reviewed the reproductions of figures which have been identified as Dayan Deerh or another war deity (Sülde tngri, Dayičin tngri) by researchers and I have compared them to a modern scroll painting documented by our expedition and examined below. The drawing that resembles most closely the main figure in this scroll was published by Walther Heissig (1980, p. 92). The deity appears as a mounted war god with a shamanic feather crown on his head. The two secondary figures were distorted in the reproduction but their position and their outline suggest that they are identical to the figures in the scroll picture presented below. Another picture of a war deity with a feather headdress has been identified as Dayan Deerh by Judit Vinkovics in the catalogue of the Ferenc Hopp Museum’s exhibition Demons and Protectors.13 The picture, dated to the twentieth century, shows three figures with the equestrian deity Dayan Deerh (in the middle) wearing a feather crown, holding attributes in his hand which are also held by the figure in the Mörön scroll picture examined below. The two side figures are almost wholly identical to the male and female figures identified as the son and daughter of Dayan Deerh, except for the attribute held in the man’s right hand which is an arrow. In the catalogue its identification as Dayan Degereki is question marked, but the feathers arranged in sets of three behind tiny round mirrors confirm that the deity is indeed Dayan Deerh. 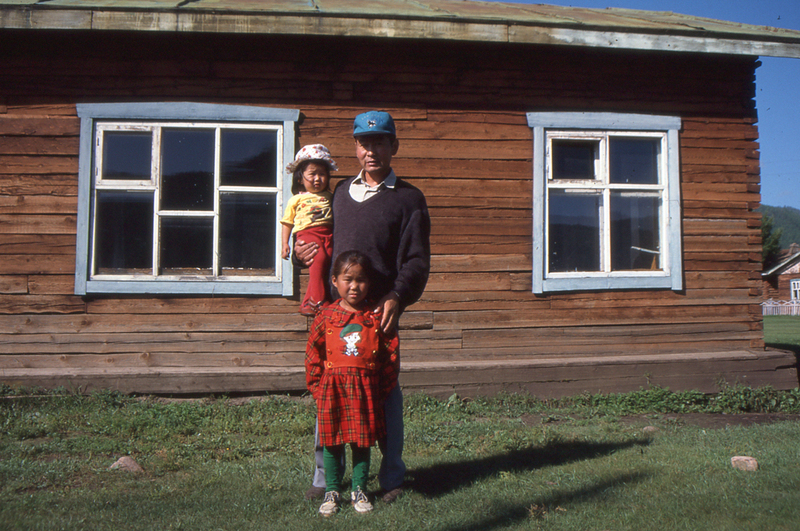 The geographical area where depictions of Dayan Deerh can be found is not limited to the Hövsgöl, and it is known also among the Buryats. A Buryat representation of similar structure has been presented by Gerasimova (1999, fig. 7). In it, Dayan Deerh wears a war helmet adorned with feathers; his mount, his attributes and the secondary figures are also identical to those in the scroll picture. Rinčen (Rintchen 1955, pp. 8-16) has also published the drawing of a figure that he identified as Dayan Deerh, although his main distinguishing attribute, the feather crown, is missing and is replaced by a pointed cap. His armament is similar to that of the figures discussed so-far, but he has a whip in his hand; there are no secondary figures in the picture, and the background is a monastery entrance. 12A common feature of Mongolian martial god depictions is that they show various “enemy-defeating” protector deities or dalha (Tib. dgra lha) who, through their name and partly in their function, demonstrate a Tibetan origin.14 Their appearance is similar to Mongolian war gods: their accoutrement includes an armour, a helmet, a bow in a bow case, arrows in a quiver, and a sabre or a sword, while their attributes and horse equipment are similar to those of Dayan Deerh. There is a 33.8 cm tall bronze figure labelled “war god” (Kriegesgottheit) in the catalogue Die Mongolen; it is the largest figure of a group of nine (Bronzgruppe von neun betrittenen geharnischten Kriegern) and presumably the leader of the dalha group as the other members areall smaller (according to the catalogue).15 The fact that the nine dalha share a lot of Dayan Deerh’s armament and horse equipment can be seen even more clearly from a Buryat scroll picture made at the turn of the 19-20th centuries (Baldanžapov 1995, p. 148). In this scroll, the main figure wears a tiger skin bow holder and a sword on the left side, his arrow quiver worn on the right cannot be seen; his horse furniture is adorned with similar tassels to Dayan Deerh’s. His attributes are different: he holds an arrow in his right hand and a demon-catching lasso in his left. Similar dalha representations were on display in the Ferenc Hopp Museum’s exhibition entitled Demons and Protectors (Vinkovics 2003a, p. 85, 2003b, p. 90). 13The depictions of Dayan Deerh can be compared to those of goviin lha (Mong. gobi-yin lha, Tib. ’go ba’i lha or ’go ba’i lha lnga “five go ba’i lha”) and Beg tse (Halh Begj, Tib. Beg tse), which abound in areas populated by Mongols. The function of the goviin lha is to protect individuals. It is held by traditional folk religion that the five deities are born together with the person and occupy different parts of his/her body.16 In their depictions, all of the five goviin lha are sat on saddle animals. 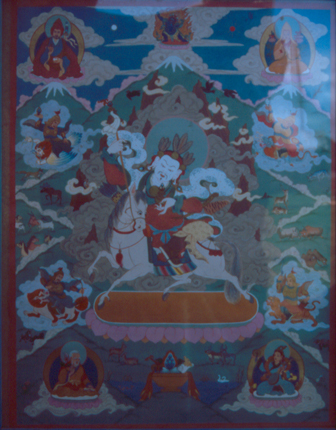 The female goddess mo lha, often in the middle, rides a mule; the four male deities ride horses adorned with harnesses similar to Dayan Deerh’s. The weapons of three of these five deities (srog lha, dgra lha, yul lha) are similar to Dayan Deerh’s: a bow case carried on the left and a quiver for arrows on the right. A yul lha has a bow in his right hand and arrow in his left, a dgra lha carries an arrow with a ribbon in his right hand and a tether in his left, a srog lha has a lance with a pennon in his right hand and his horse’s rein in his left. Their representation and detailed analysis appeared, among other places, in the aforementioned catalogue of the Ferenc Hopp Museum (Vinkovics 2003b, pp. 90-91) and in a publication of the Asian Art Museum of San Francisco (Berger, Bartholomew 1995, pp. 228-229). 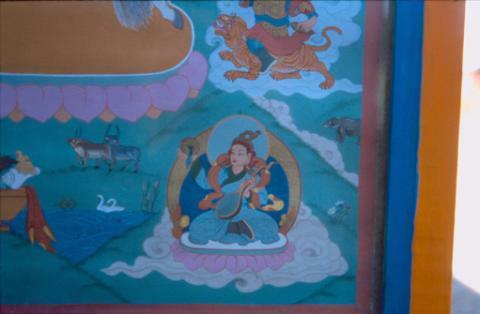 The attributes and appearance of the central figure in the scroll picture analyzed below are similar to those of Tibetan mountain deities as well. 17 Galbaabadrah did not mention his name. 18 Galbaabadrah established a small shrine in his house for the local believers. 19 Sound and photo archives of the expedition, 1998. 20 Even (1984, pp. 12-18) analyzed a text variant as a preliminary to her book. 15Before embarking on the interrelationships between the texts and the picture, I find it necessary to review the main data of earlier text editions. Shamanic texts of various genres addressed to Dayan Deerh were collected by Rinčen (Rintchen 1975, pp. 89-94), translated into French and annotated by Marie-Dominique Even (1988-1989).20 One of the best-known invocations to Dayan Deerh in written literature was published by C. Damdinsüren (Damdinsürüng 1959, pp. 127-131) in his collection of One-hundred Mongolian literary treasures. Alice Sárközi (2004) compared Damdinsüren’s text with an Oirat text variant collected during our expeditions. 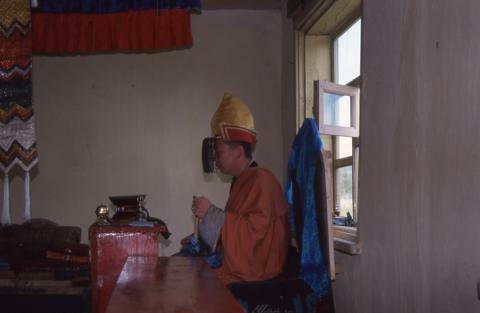 In his afore mentioned study Róbert Török began to elaborate on the ritual texts in the Tibetan language collected by the expedition (Török 2009). I have examined the aspects of performance, genre and sacred communication of all the Mongolian texts about Dayan Deerh, with detailed philological apparatus, in my unpublished monograph on Darkhad shamanic texts. On the basis of the known textual tradition, the texts addressed to war gods of a protective function such as Dayisun and Dayičin tngri (cf. Tib. dgra lha) and Sülde tngri are also to be examined. Walther Heissig (1964, pp. 190-202) published a study on the martial god Dayisun tgnri contributing important clues concerning the cult of Dayan Deerh as well. The ritual texts usually contain a brief description of the appearance of the invited deity, its attributes and escorts, but some give a detailed spectacular account of the transcendental being descending to the venue of the ritual – Walther Heissig (1964, pp. 200-202) published such a text about Sülde tngri. In Hessig’s monograph on folk religious texts (1966, pp. 157-163) there are three invocations to the war gods Dayisud tngri, Sülde tgnri and a Qara Sülde ritual with a Mahākāla invocation. 16The central figure of the Mörön scroll picture is Dayan Deerh (fig. 7 and fig. 9), he is represented as an equestrian war god (cf. Sülde tngri, Dayisun or Dayicin tngri as well as the dalhas, the goviin lha, Beg ce and the Tibetan mountain deities). The most characteristic iconographic feature of Dayan Deerh is the feather headgear evoking his shamanic identity, which – as far as I know – is particular to him and differentiates him from the rest of the above-mentioned war gods depicted with helmets. 17On the painting, Dayan Deerh’s complexion is pale, he wears a finely designed beard and moustache, his ears are elongated and ringed to meet the iconographic requirements of beauty. The headgear he wears on the top of the head consists of three bronze mirrors attached to a red band and of a triple plumed crest, in agreement with the text. 21 For details, see Birtalan 2002, pp. 69-88. 18In Mongolian and Tibetan popular beliefs the owl (Halh šar šuvuu) keeps away demons21 and may appear as the herald of shamans. The headdress of Darhad (Darkhad) shamans sometimes includes owl feathers (fig. 10), too, in addition to the feathers of daytime birds of prey (mainly the eagle). The feathers worn on the head and all over the garments indicate the close relationship between the shaman and his/her animal ancestor or assistant spirit. This shamanic headdress is the closest analogy to Dayan Deerh’s feather crown (fig. 9). Among the Mongols, superimposed on the original stratum of beliefs, is a Europe-wide known view – probably mediated by the Russians – that the owl is the herald of death. However the owl feather mentioned here in the text has a protective function among both the Mongols and the neighbouring Kazak people. 23 Balžir’s ritual accoutrement is presented in Birtalan 1993, pp. 1-10. 21The red gown of the central figure is held together with a blue sash. Behind him a white cloud-like mantle is hovering. 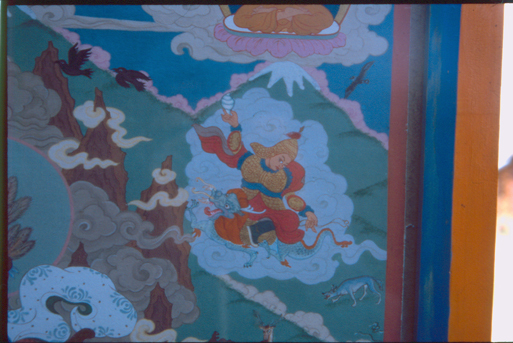 In Mongolian Buddhist representations, cloud patterns on mantles are frequent. 22In his right hand he is holding a white banner (Halh cagaan darcag, Skr. dhvaja) similarly to other Dayan Deerh pictures. In his left hand there is a jug full of gems (Halh erdniin bumb, Skr. Ratnakalaśa, fig. 9). 23Dayan Deerh is a martial god, with weapons and armour (although the suit of armour is missing in the Mörön picture, it is an important motif in the shamanic texts). When a shaman invites him in the ritual, he lends him his body and the deity speaks through him. The shaman’s clothing and accessories become identical to Dayan Deerh’s paraphernalia. The next section presents the shaman’s transfiguration. 24 Halh žin = 0,6 kp. On my shoulders and shoulder blades. I girded my sharp steel sword on. I dressed my body up in armour. 24Dayan Deerh’s mount (Halh hölög) is a white steed with highly ornate horse harness (fig. 9). As the sacrificial text addressed to him reveals, it is as fast as whirlwind (Halh hui salhi šig hurdan). 25The minutely elaborate horse equipment has salience in the scroll picture but the texts do not mention it. 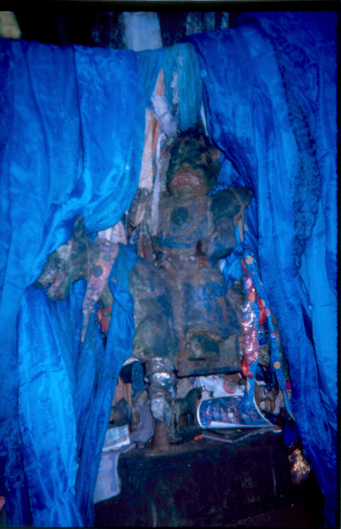 The characteristics of the saddlery of protective Buddhist deities and local spirits converted to the protection of the dharma are more or less identical to that of the Inner Asian warriors, as Katalin Uray Kőhalmi pointed out in her study on the representation of goddess Lhamo (Uray-Kőhalmi 1987, pp. 233-249). The armament of Dayan Deerh is identical in the visual representations and the ritual texts: his leopard skin bow holder and tiger skin quiver are visible in the picture (fig. 9, the design is recognizable in the picture exhibited in the Ferenc Hopp Museum as well). In the text, the material is lion skin and tiger skin, for the sake of alliteration. Deities equipped with similar weapons can be found among the dalha and goviin lha, as well as among the Tibetan mountain gods. 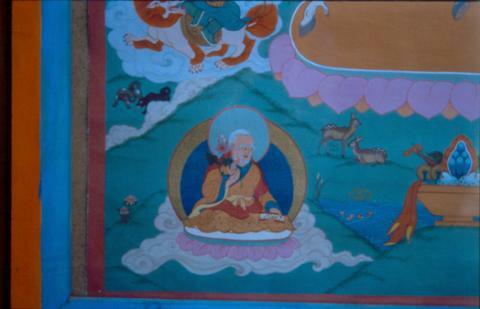 26Beside Galbaabadrah’s scroll picture, I know of only one other representation in the upper third ofwhich dharma protectors and famous teachers of Buddhism are depicted. The picture is owned by a Mongol family in Cagaan Üür district (fig. 11). 27It is framed and displayed so that only the centre of the upper third can be seen, with its depiction of Vajrapāṇi. In the upper right and left corners the owner has placed two other pictures: on the right side, the photograph of an Avalokiteśvara statue, and on the left side a picture of the 14th Dalai Lama. Two figures in the upper third of Galbaabadrah’s scroll picture are meant to reinforce the Buddhist nature of Dayan Deerh and to legitimize its place among the Buddhist dharma protectors. On the right is Padmasambhava (fig. 8) who tamed the local spirits and put them into the service of Buddhism. In this picture Padmasambhava is shown with the attributes and attire of the “precious master”, with a double vajra in his right hand, and a skull cup filled with blood (Mong. γabala, Skr. kapāla) and the magic rod (Skr. khaṭvāṅga) in his left hand, indicating that he is a tantric master. 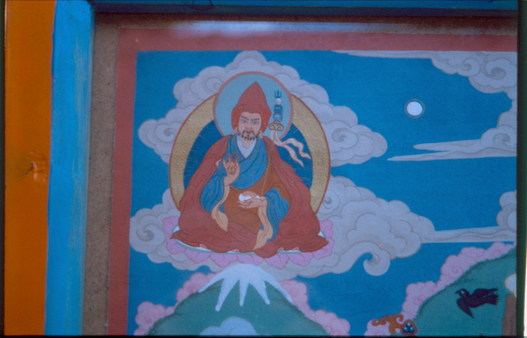 His headgear is that of the high-ranking masters of the Nyingma order (rNying ma) and his clothing is a monk’s gown.26 In the upper left corner is a familiar depiction of Tsong kha pa, the founder of the yellow hat Gelug order: he wears a lama’s frock; he has a lotus flower in his right hand (Mong. badam, Skr. padma) and a book (Mong. nom, Skr. pustaka) in his left hand. The text also pays tribute to both Buddhist masters, stressing that Dayan Deerh was initiated by them. Although they are not included in the scroll picture, the text mentions the Dalai and Panchen lamas, revered by the Mongolian church as the greatest authorities, as well as the head of the Mongolian church, the Bogd gegeen (Mong. Boγda gegegen), all featuring as the initiators of Dayan Deerh. The guiding of the Dalai and the Panchen lamas. You pledged the vow of the pure believer to the Exalted Saint. 28The two secondary figures in the lower third of Galbaabadrah’s scroll picture are identified in Mongolian tradition as Dayan Deerh’s son and daughter. The hoary old man in the bottom right corner (who appears much older than Dayan Deerh) is Dayan Deerh’s son Saraitan27 (fig. 12). 28 D.D.1. and its similar motif in D.D.3, too. 31In the bottom left corner Dayan Deerh’s daughter Saraimoo is shown. She is said to be the one who subdued the wild unruliness of the world (fig. 13). 32Similarly to the goddess of eloquence Sarasvatī, she holds a string instrument (Mong. biba, Skr. vīṇā) in her left hand,29 lifting high a cymbal (Halh can) with her right. Saraimoo is connected to Dayan Deerh’s fertility aspect as she is credited with granting children to those who long for them. On her right figures a pair of swans swimming in a lake, a pair of cattle/yak, and the feminine symbol called “queen earring” (xatan süix). 30 This passage can be found both in D.D.1. and in D.D.3. 33In the scroll picture, similarly to the goviin lha representations, beasts and domestic animals depicted in pairs play salient roles. The pairs of animals refer to fertility magic, with some also mentioned by the texts and oral tradition, which ascribe special significance to them (fig. 9). 34To the right of Saraimo, there is a pair of swans in a pond (fig. 13). The swan – the heavenly swan maiden descending from the upper world – is the ancestress of several Inner and Eastern Asian peoples. It plays a central role in the eastern Buryat mythology and folk religion, but it is also worshipped in Mongolian areas and its hunting is taboo (Birtalan 2001, p. 1037). The invocation Nr. 3 to Dayan Deerh includes several prohibitions aimed at protecting nature, and also mentions the defence of swans. Yürün yüsün šošoolgoos ug garaltae. Xun šuwuug büü cočoo ! It has the shape of a swan. It comes from a clan of ninety-nine shoshologs. Do not frighten the swan ! 32 Birtalan 2001, p. 1037. 33 For a detailed analysis of the mythic role of the wolf, see Birtalan 1995, pp. 99-111. 35In the middle of the scroll picture there is a fox on the right facing a wolf on the left. Both are couriers in Mongolian shamanism. The fox is usually associated with the lower world; in Buryat mythology it is the messenger of the lord of the netherworld, Erlig khan; killing the fox brings ill luck to the whole clan.32 In addition to the wolf,33 a frequently called messenger of the shamans is the raven, also symbolizing the shaman’s strength. Among the ongons of Darhad shamans both its ornithoid and anthropo-ornithoid forms are prevalent. Oral tradition says that the most powerful shamans have nine ravens to help them. In the scroll picture, there are three ravens flying around Dayan Deerh’s head; this motif can also be found in pictures of dalha. 34 For a detailed analysis of the role of the stag, see Birtalan 1995, pp. 99-111. 38In the scroll painting, Dayan Deerh is surrounded by the “four strong ones” (fig. 9, Mong. dörben küčüten), the ritual prayer flag or the “wind horse” (Mong. kei mori, Halh hiimor’, Tib. rlung rta),36 the four mythic animals are symmetrically arranged: the Garuda in the top right corner, the snow lion bottom right, the tiger bottom left and the dragon top left (fig. 14). The four strong ones are saddlers for four armoured male figures. There is no mention of these four riders in the traditional texts. 39In the present study I have compared textual and pictorial traditions of Dayan Deerh, a well-known deity in Mongolian Buddhism, shamanism and folk religion. The texts (shamanic invocations) and the tangkha painting have been collected during a field research in Hövsgöl province in Mongolia. In sacred texts influenced by Buddhism several shamanistic and Buddhist features are intertwined, which I have analyzed in detail in my former studies. Here I dealt only with the connections between the texts and the pictorial representation analysing the motifs in the tangkha that appear in the invocations as well. In order to comprehend Dayan Deerh’s place in the Tibeto-Mongolian tradition I outlined the larger context of the worship of warrior gods in Mongolian Buddhism, and made references to the mythological background of Mongolian shamanism and folk religion. Nevertheless, some problems remain unsolved: the extent of the Tibetan influence upon Mongolian practices, the preservation of pre-Buddhist layers (prior to the Buddhist conversion of the Mongols), the problem of borrowing or maintenance of certain mythemes and the origin of the depiction of weaponry in these pictures. The further exploration of the connection between this scroll painting and the Tibetan traditional depiction of warriors and mountain deities will be the topic of another study. 1995 Buddiiskaia živopis’ Buriatii iz fondov Muzeia Istorii Buriatii im. M. N. Hangalova (Nyutag, Ulan-Ude). 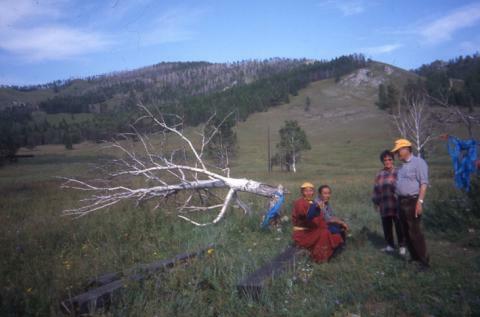 1995 Mongolia. The Legacy of Chinggis Khan (San Francisco, Asian Art Museum of San Francisco). 1993 Scapulimancy and Purifying Ceremony (New Data on the Darqad Shamanism on the Basis of Materials Collected in 1992), in Chieh-hsien Ch’en (ed. ), Proceedings of the 35th PIAC September 12-17, 1992 Taipei, China (Taipei, Taiwan, National Taiwan University and Center for Chinese Studies Materials), pp. 1-10. 1995 Some Animal Representations in Mongolian Shaman Invocations and Folklore, Shaman V (Autumn), pp. 99-111. 1996a A Lineage of Tuvinian Shamans in Western Mongolia. Assimilation and Heritage, in Giovanni Stary (ed. ), Proceedings of the 38. PIAC, Japan Kawasaki 1995 (Wiesbaden, Otto Harrassowitz), pp. 85-105. 1996b Sámánok révülési eszköze, az ongon [The ongon, the instrument of the shamans’ trance], in Birtalan Ágnes (ed. ), Tanulmányok a mongol népi hiedelemvilágról [Studies on Mongolian belief system] (Budapest, Nemzeti Tankönyvkiadó), pp. 28-46. 2001 Die Mythologie der mongolischen Volksreligion, in Egidius Schmalzriedt und Hans Wilhelm Haussig (ed. ), Wörterbuch der Mythologie. I. Abteilung. Die alten Kulturvölker, 34, Lieferung (Stuttgart, Klett-Cotta), pp. 879-1097. 2002 An Oirat Ethnogenetic Myth in Written and Oral Traditions (A Case of Oirat Legitimacy), Acta Orienatlia Hung. Volume Commemorating the 100th Birthday of its Founder Louis Ligeti, 55, pp. 69-88. 2005a An Invocation to Dayan Deerx Collected from a Darkhad Shaman’s Descendant, in Stéphane Grivelet, Ruth Meserve, Birtalan Ágnes, Giovanni Stary (ed. ), The Black Master. Essays on Central Eurasia in Honor of György Kara on his 70th Birthday (Wiesbaden, Harrassowitz Verlag), pp. 21-32. 2005b The Mongolian Great Khans in Mongolian Mythology and Folklore, Acta Orientalia Hung.,58.3, pp. 299-311. 2008 Material Culture (Traditional Mongolian Culture I. ), Materielle Kultur. (Traditionelle mongolische Kultur I. ), A mongol nomádok anyagi műveltsége. (Hagyományos mongol műveltség I.). Ulamžlalt mongol soyol. (Wien, Budapest, IVA-ICRA Verlag-ELTE, Belső-ázsiai Tanszék) [DVD]. Birtalan, Á., Sipos, J., Coloo, £. 2004 “Talking to the Ongons”: The Invocation Text and Music of a Darkhad Shaman, Shaman 12 (Spring-Autumn), pp. 25-62. 1959 Mongγol uran ǰokiyal-un degeǰi ǰaγun bilig orosibai. Corpus Scriptorum Mongolorum XIV (Ulaγan Baγatur). 1984 Dajan Deerx invoqué, Journal of the Anglo-Mongolian Society IX, pp. 12-18. 1988-1989 Chants de chamanes mongols, numéro special de Études Mongoles et Sibériennes 19-20. 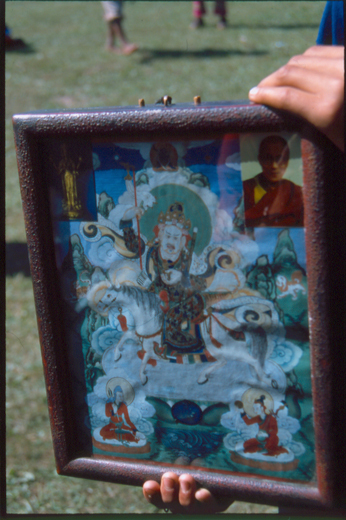 1991 Padmasambhava. Leben und Wudertaten des grossen tantrischen Meisters im Spiegel der tibetischen Bilderkunst (Köln, DuMont Verlag). 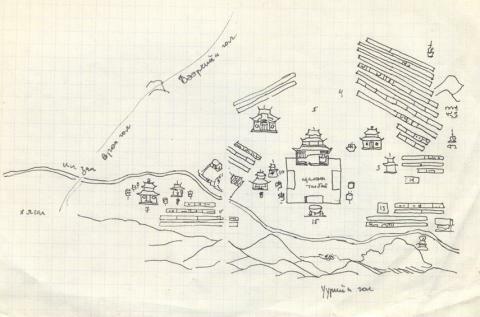 Galdanova, G. P., Zhukovskaya, N. L., Ochirova, G. N.
1984 The Cult of Dayan Derkhe in Mongolia and Buryatia, Journal of the Anglo-Mongolian Society IX, 1-11. Gantogtokh, G., Kara, G., Tsoloo, J. 1998 Buryat Shaman Songs and Rites, Uran zohiol sudlal [Studies on literature] 5, pp. 95-140. 1999 Obriady zaščity žizni v buddizme Central’noi Azii (Ulan-Ude, Izdatel’stvo BNC SO RAN). 1964 Ein Ms.-Fragment zum Kult der Dayisud-un Tngri und andere mongolische Fragmente im Ethnographischen Museum Antwerpen, Central Asiatic Journal IX, pp. 190-202. 1966 Mongolische volksreligiöse und folkloristische Texte aus europäischen Bibliotheken mit einer Einleitung und Glossar in Verzeichnis der orientalischen Handschriften in Deutschland. Supplementband 6 (Wiesbaden, Franz Steiner Verlag GMBH), pp. 157-163. 1980 The Religions of Mongolia. (London and Henley, Routledge and Kegan Paul). 2004 Die Mongolen (Innsbruck, Pinguin-Verlag, Frankfurt/Main, Umschau-Verlag). 2007 Inside and Outside the Mirror: Mongolian Shamans’ Mirrors as Instruments of Perspectivism, Inner Asia 9, pp. 173-195. 2000 “May They Here Increase ! May All Gather Together !” A Woodprint and its Inscriptions from the Mongolian Collection at the Ferenc Hopp Museum of Eastern Asiatic Arts, Ars Decorativa 21, pp. 79-102. 2003 The Cult of Good Luck, in Béla Kelényi (ed. ), Demons and Protectors. Folk Religion in Tibetan and Mongolian Buddhism (Budapest, Ferenc Hopp Museum of Eastern Asiatic Art), pp. 47-78. 1993 Magiia tuvinskih šamanov (Kyzyl). 2006 Warriors of The Himalayas: Rediscovering the Arms and Armor of Tibet (New York, Metropolitan Museum of Art). Mongolia, 96 Korea Exhibition 1996 (Seoul). 1979 Mongol ard ulsiin ugsaatnii sudlal helnii šinžleliin atlas. Etnolingvističeskii atlas MNR. Atlas ethnologique et linguistique de la République Populaire de Mongolie I-II (Ulaanbaatar, BNMAU Šinžlex Uhaanii Akademi). 1975 Matériaux pour l’étude du chamanisme mongol III. Textes chamanistes mongols, Asiatische Forschungen 40 (Wiesbaden, Otto Harrassowitz). 1955 À propos du chamanisme mongol : le cult de l’ongon Dayan Degereki chez les Mongols Khotougaites du Kossgol, Studia Orientalia XVIII/4, pp. 8-16. 1983 Ikonographie und Symbolik des Tibetischen Buddhismus: Teil A II. Die Sādhanas der Sammlung Ba-ri Brgya-rtsa, Asiatische Forschungen 77 (Wisesbaden, Otto Harrassowitz). 2004 Dayan Degereki megidézése [Evoking Dayan Degereki], in Ágnes Birtalan (ed. ), Helyszellemek kultusza Mongóliában [The cult of local spirits in Mongolia] (Budapest, Új Mandátum Könyvkiadó), pp. 161-176. 2009 A Tibetan Offering Ritual to Dayan Degereki, a Mongolian Local Deity, Acta Orientalia Hung.,62.1, pp. 45-87. 1987 Zentralasiatische Elemente am Pferdegeschirr der Dpal‑ldan Lha‑mo, Zentral Asiatische Studien 20, pp. 233-249. 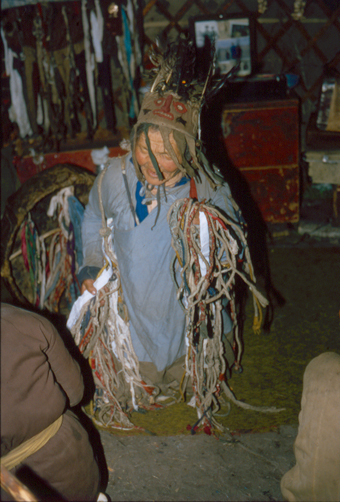 2003a Folk Religion as Reflected in Mongolian Objects, in Béla Kelényi (ed. ), Demons and Protectors. Folk Religion in Tibetan and Mongolian Buddhism (Budapest, Ferenc Hopp Museum of Eastern Asiatic Art), pp. 79-88. 2003b Life-protecting Deities and Personal Protecting Deities in Folk Buddhism, in Béla Kelényi (ed. ), Demons and Protectors. Folk Religion in Tibetan and Mongolian Buddhism (Budapest, Ferenc Hopp Museum of Eastern Asiatic Art), pp. 89-92. 1 Summaries of the research carried out during the expedition have been published in numerous studies devoted to the elaboration of the collected material (recently on a DVD: Birtalan 2008). At present, this research is supported by the Hungarian National Research Fund (OTKA) as project Nr. 62501 (supervisor: Ágnes Birtalan). 2 Unless otherwise specified, the Mongol Halh (Khalkha) Cyrillic is transliterated using EMSCAT rules of equivalence. 3 Galdanova, Zhukovskaya, Ochirova (1984), Even (1988-1989), Sárközi (2004), Török (2009). In my monograph devoted to Darhad shamanic texts, I give a multifaceted analysis of all the shamanic texts about Dayan Deerh that were collected during the expedition: Birtalan, Darkhad Shamanic Texts. Performer, Genres, Communication (manuscript). 4 This fact was mentioned by several respondents during our expedition. Cf. Expedition sound archive: recordings of 1998. 9 The data collected on this phenomenon during the 1998 expedition (cf. sound and photo archives of the expedition), will be analyzed in a separate study. 10 The mythological role of Dayan Deerh will be analyzed in a separate study, which will present the religious and mythic context of the deity on the basis of the related textual tradition. 11 Dayan Deerhiin Duudlaga “Invocation to Dayan Deerh [deity]” (informant: monk Galbaabadrah, Mörön, Aug. 1998, sound archive of the expedition). Hereafter I refer to this text as D.D.1. The transcription of these fragments is meant to render the Darhad pronunciation of the informant. In the transcription of Darhad texts the following symbols are used: ǰ (voiced palato-alveolar affricate as English j) j (voiced alveolar affricate as English ds, dz) and x (voiceless velar fricative as German ch). 12 The concept of ongon and its role in Mongol beliefs and folk religion are discussed in several studies; for a summary of the theories and a detailed bibliography, see Birtalan, Sipos, Coloo 2004, pp. 25-62. 14 The armour of the Tibetan warrior gods might be interpreted as of Inner Asian origin; however the present article does not intend to discuss this problem. A recently published series of studies offers good perspective on this question, see La Rocca 2006. 15 Heissig und Müller 1989, p. 160. The statue is also reproduced in the catalogue of an exhibition held in South Korea: Mongolia (1996, p. 63). 16 The Tibetan names of the five deities: mo-lha “goddess”, pho-lha “(male) god”, srog lha “deity responsible for life”, yul lha “deity protecting the area”, dgra lha “deity protecting from enemy”; for details on the latter see above. On the goviin lha deities, see Vinkovics 2003b, pp. 89-92. 22 Birtalan 1996a, and for a detailed study on the role of the mirror in Mongolian shamanism see Humphrey 2007. 25 The figure of the shaman’s headdress ödön malgai “feather cap” is mixed up with the “secret” cap (daldiin malgai) that makes one invisible in the tales. The headgear of Darhad black shamans is called böö malgai “shaman’s cap”, that of the yellow shamans is called orgoi. 26 Its detailed analysis, Essen und Tsering 1991, pp. 113-115. This type of depiction can also be found in the catalogue of the Ferenc Hopp Museum, p. 88. Further similar representations: e.g. 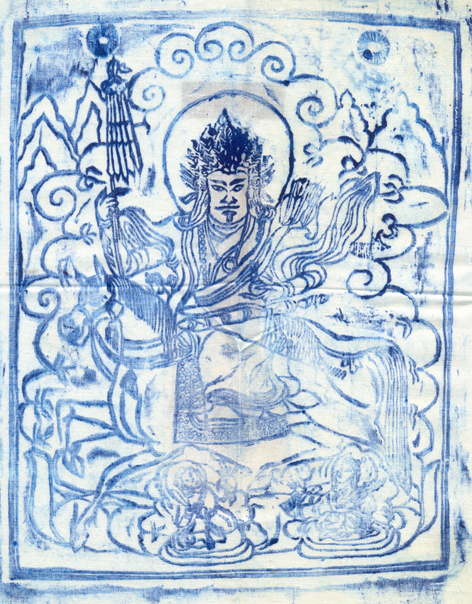 the central figure of the thangka in which Padmasambhava is depicted in another eight forms (Essen und Tsering 1991, p. 65). 27 The name is obviously of Tibetan origin, derived from sras “boy”, its Halh pronunciation is sarai; the Tibetan original of the last syllable is still to be explored (I am indebted to Judit Vinkovics for pointing this out to me.). 29 The lute is the attribute of Dhṛtarāṣṭra, the protector of east among the four mahārājahs guarding the cardinal points, and of the celestial fairies, the gandharvas. 31 Cagaadai (Halh) and his spouse Canhilan/Sanhilan (Halh) were considered to be shamans and protectors of fire, see Birtalan 2005b, pp. 299-311. 35 This motif can be compared to the Hungarian folk belief involving the fighting miraculous bull (Hung. táltos). For an analysis of the bull and Buha noyon baabai, see Birtalan 2001, pp. 954-955. 36 For a detailed analysis of “wind horse” representations and texts, see Kelényi 2000, pp. 79-102; Kelényi 2003, pp. 47-78. Docteur (habil.) de l’Université ELTE (Département d’Etudes de l’Asie Intérieure), et Directrice du Département et de l’Ecole doctorale de philologie mongole, ses recherches sur les études mongoles concernent les langues et cultures, et principalement la tradition textuelle des religions populaires chamanique et bouddhique, de différents groupes ethniques de Mongolie. Terrains: Mongolie (Régions du Nord et de l’Ouest), Mongolie Intérieure (Ordos, Üüshin), Xinjiang (Bortala), Bouriatie (Ulan-Ude).